The Cat in the Hat - 1st in the Dr. Seuss ® Book Series. Set of two ornaments. Handcrafted and Dated 1999. Sculpted by Nello Williams. QXI6457. "It's fun to have fun, but you have to know how..." chants the Cat in the Hat as he leads two children on a merry chase all through their house. The fast-moving, fast-talking cat is the creation of Theodore (Dr. Seuss) Geisel. Dr. Seuss books sparkle with a healthy dose of nonsense, begging to be read aloud and encouraging children to read "all by themselves." 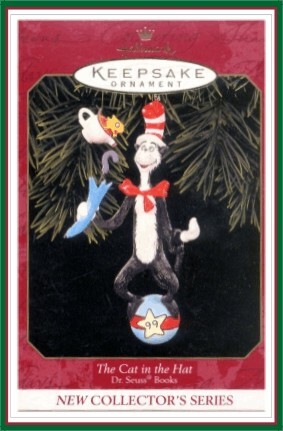 Just as "The Cat in the Hat" lead the way for a parade of popular Dr. Seuss Beginner Books, this set of two colorful ornaments in the first in a series that will feature endearing characters from a variety of Dr. Seuss books.